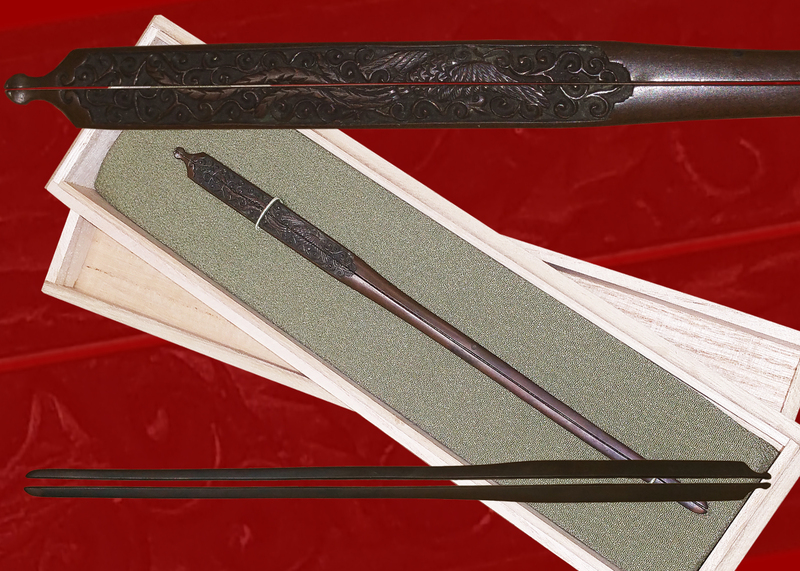 An exquisite long Shinshinto blade signed Kane Uji. 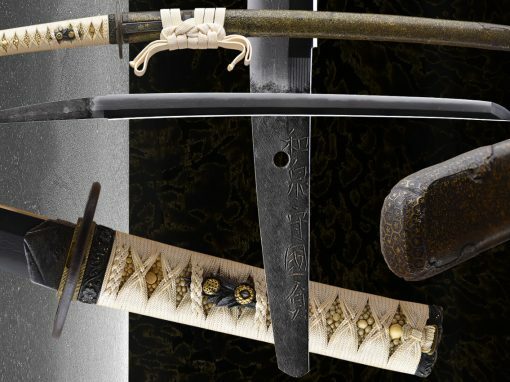 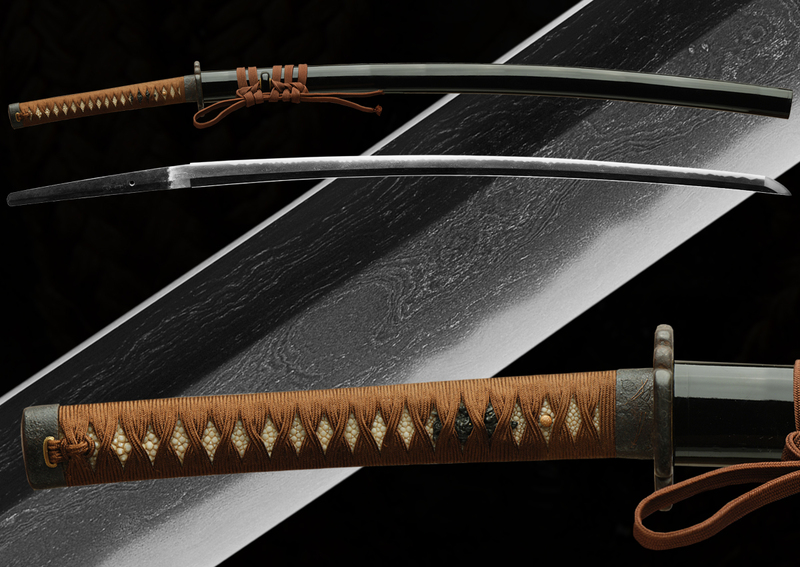 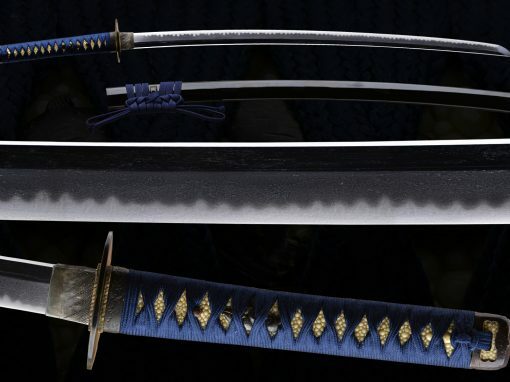 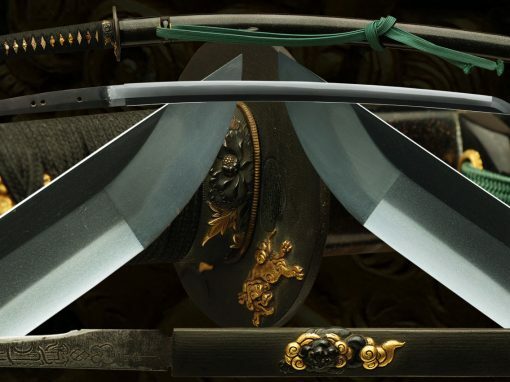 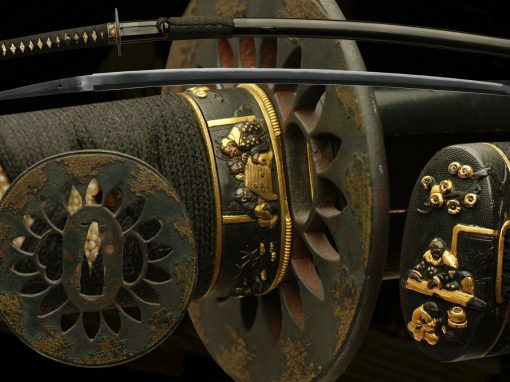 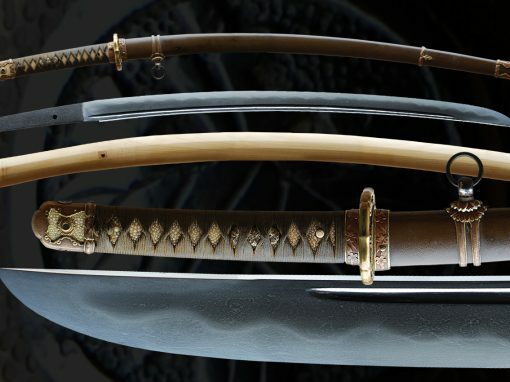 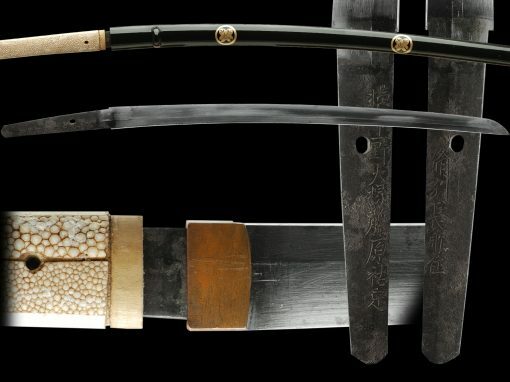 The Kane Uji line of swordsmiths is famous and dates back to the koto era. 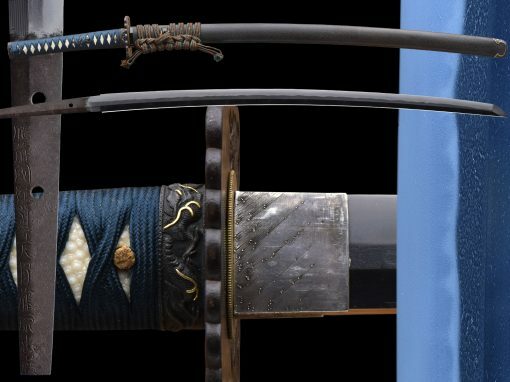 They were know to make fine quality swords that cut very well. 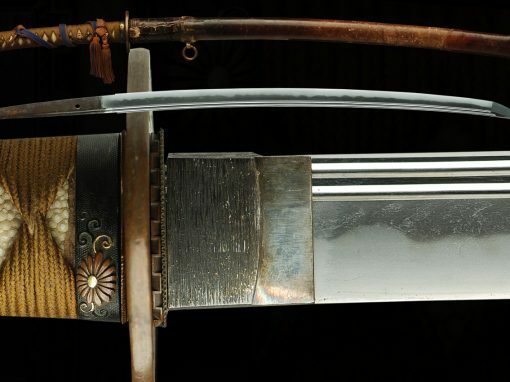 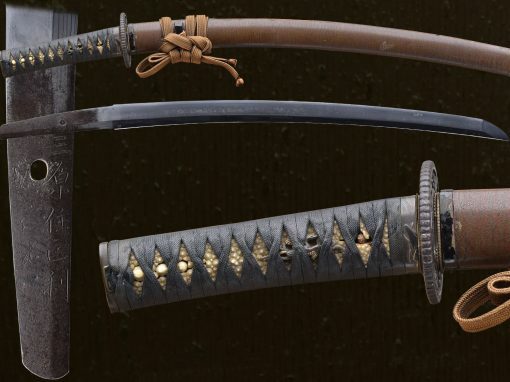 This sword measures in at almost 31″. 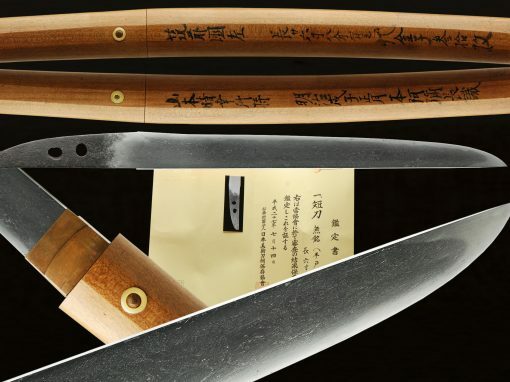 At 30 11/16″ this blade is a beautiful example of a flawless ubu Shinshinto sword loaded to the max with great activity and a wonderful hada covered in ji-nie. 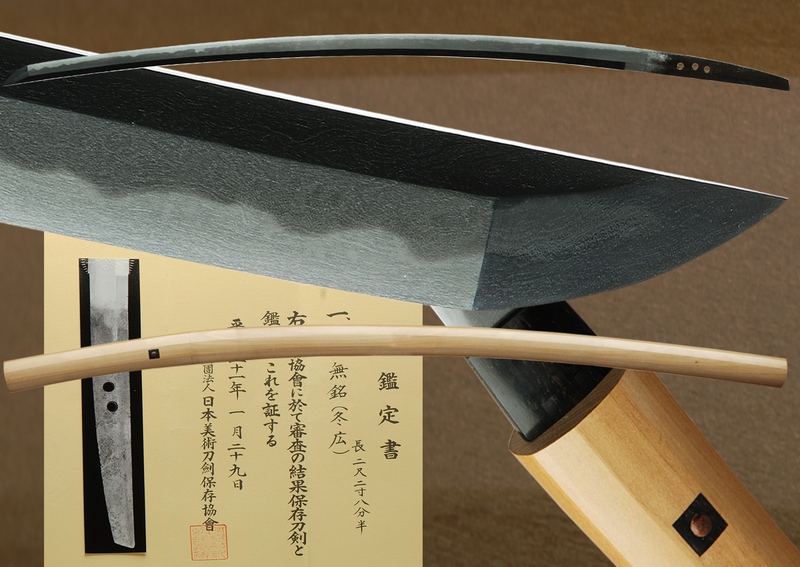 The hamon is a vibrant gunome-midare filled with sunagashi, kinsuji and ko-nie abounds. 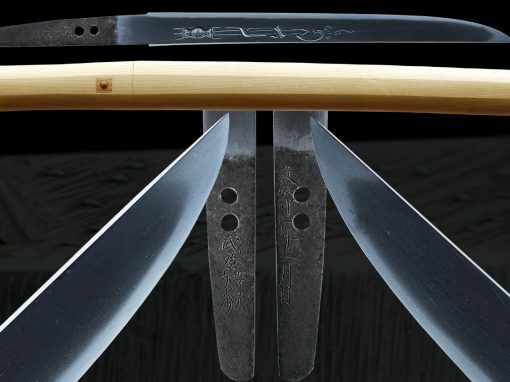 The hada is an active itame O-mokume mix with flowing masame throughout. 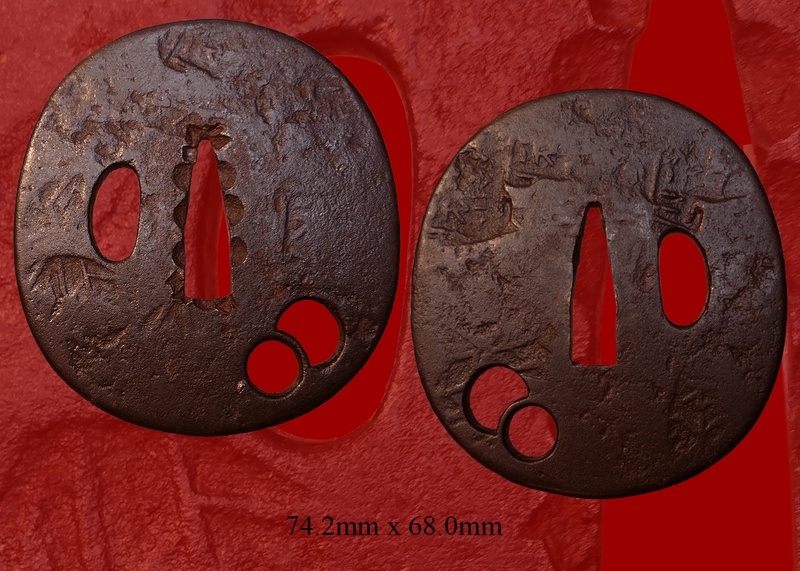 Chikei can be seen all over as well as being peppered with ji-nie. 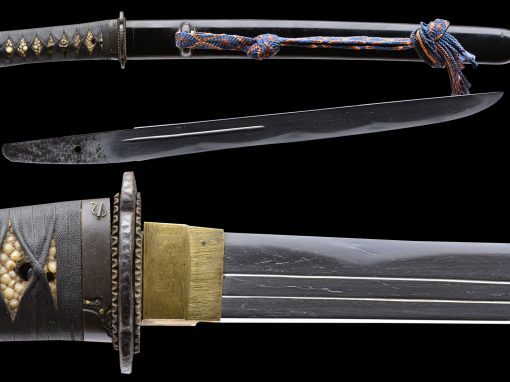 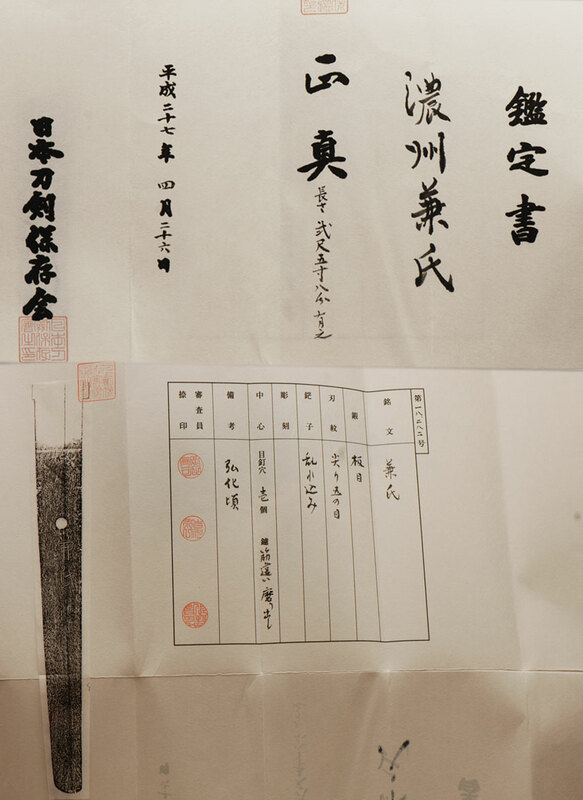 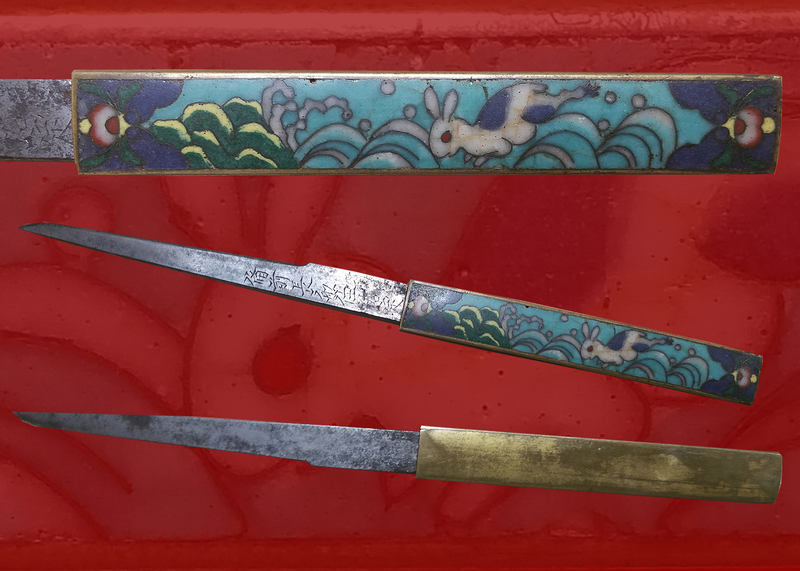 The blade is signed and papered to Kane Uji and given an approximate date of 1844. 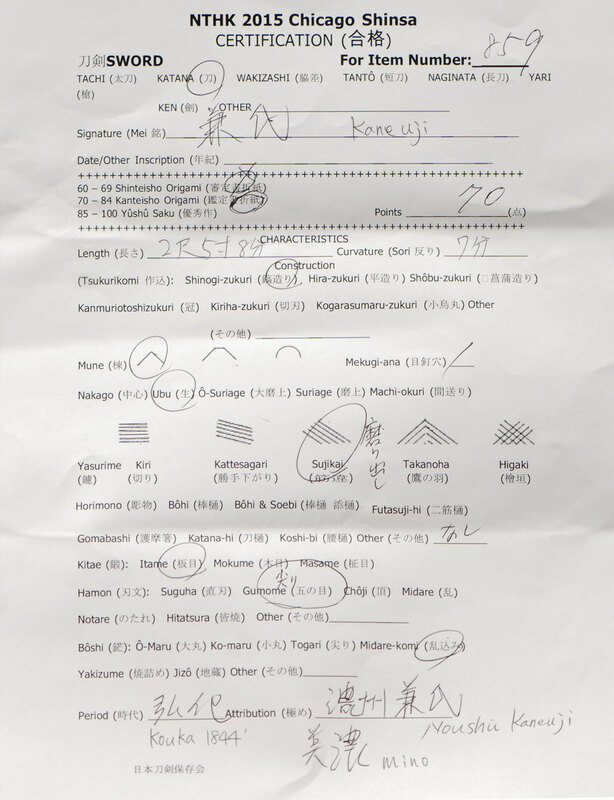 The boshi is maru finished with sunagashi. 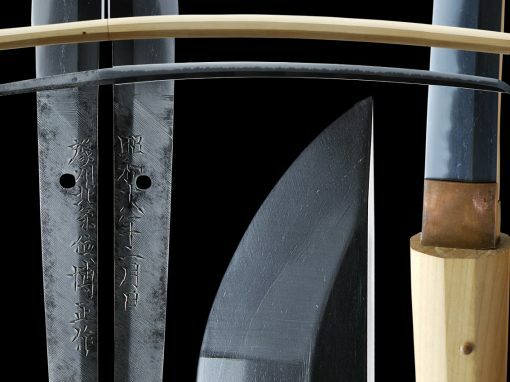 The hada has a perfect burl effect and a pleasure to behold. 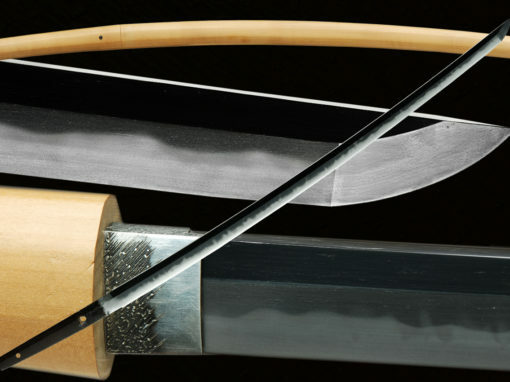 The koshirae is fitted with a high gloss black lacquer finished saya. 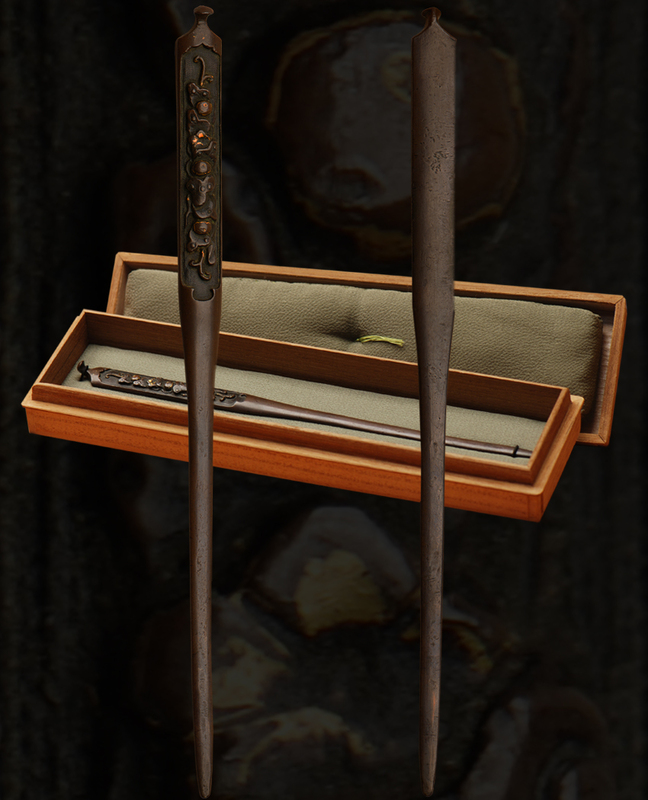 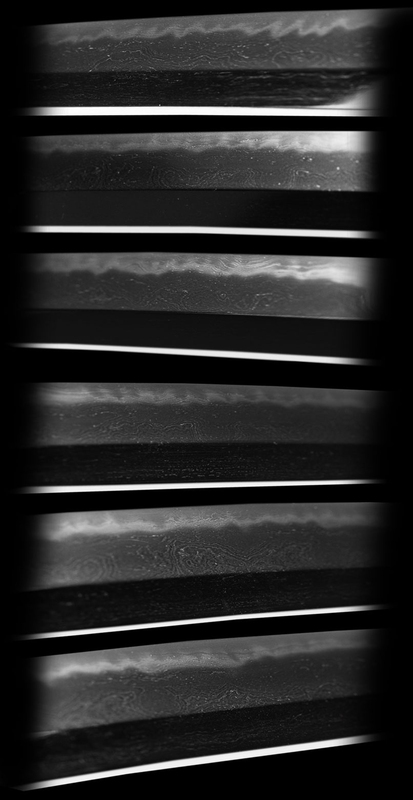 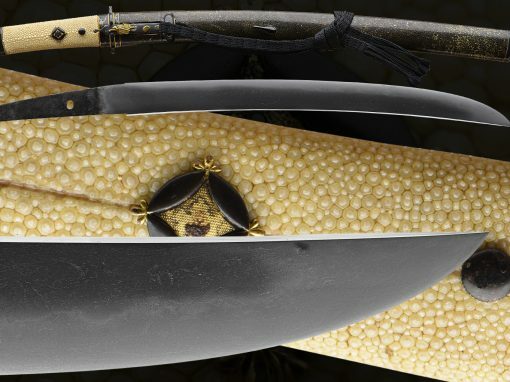 No shirasaya is nessasary for this blade. 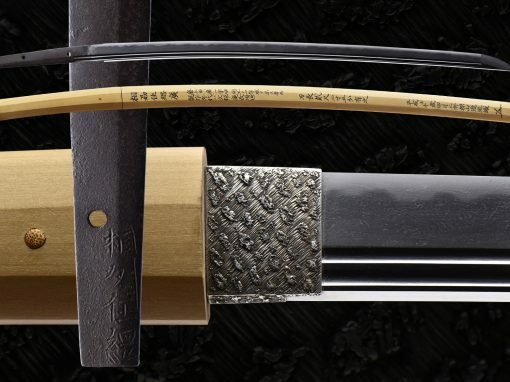 The ito and Sageo are a matching brown color to accentuate the mounts. 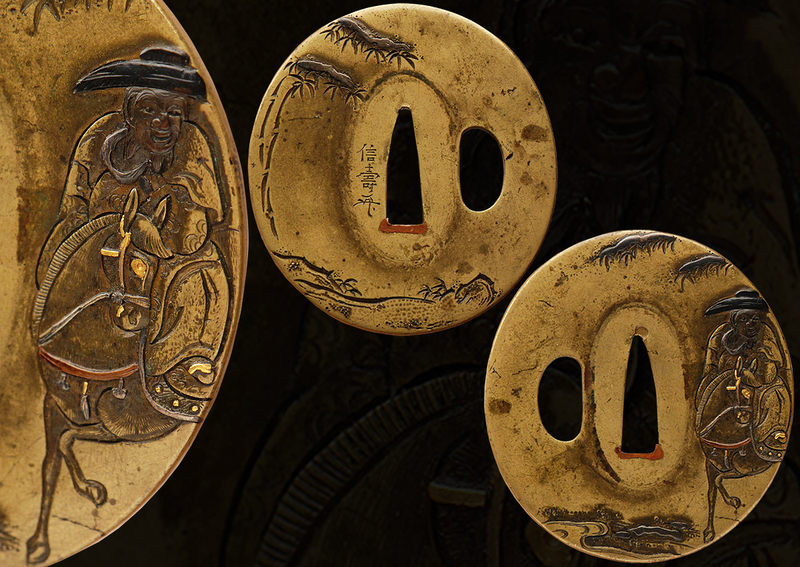 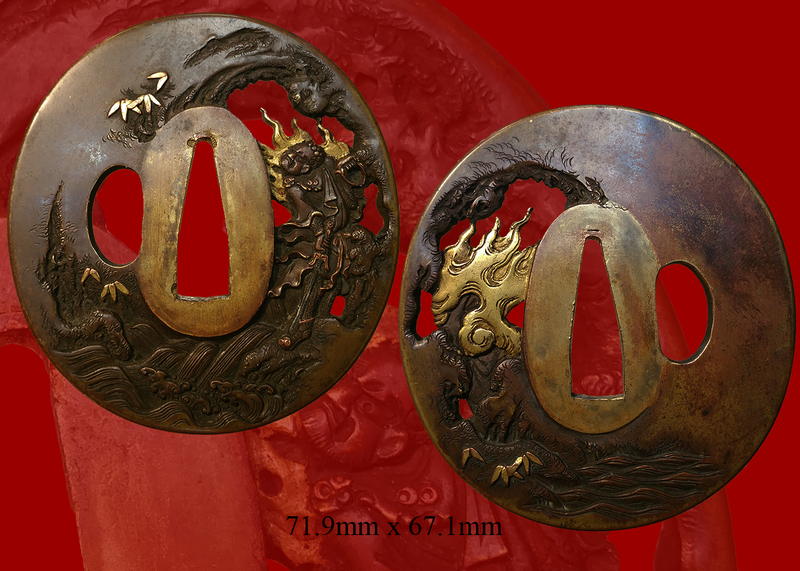 The menuki are a large pair of shakudo and gold running ShiShi. 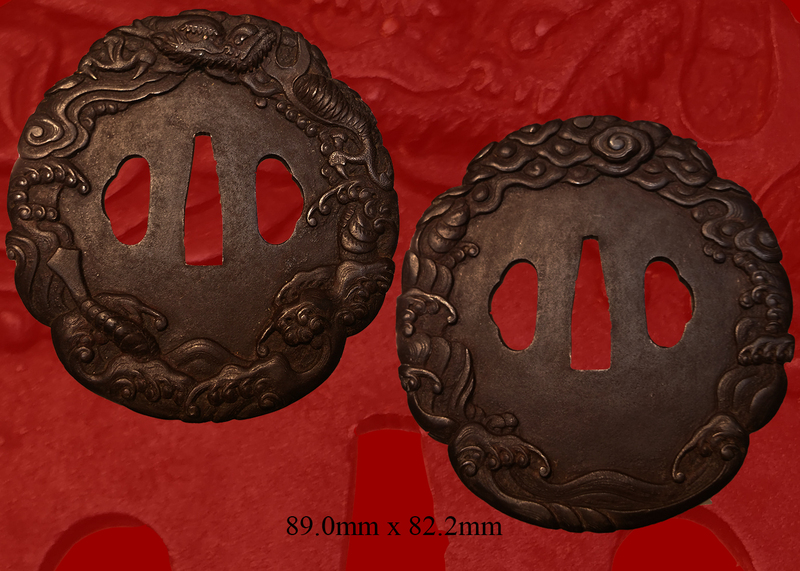 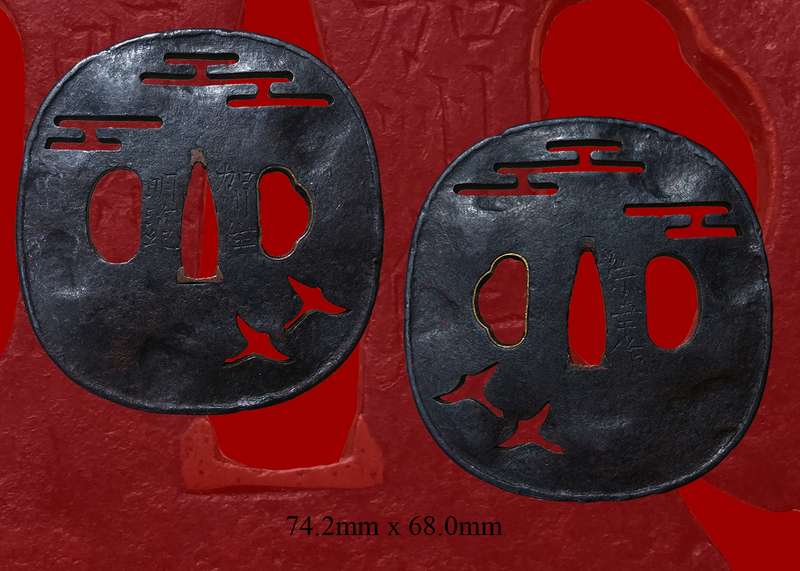 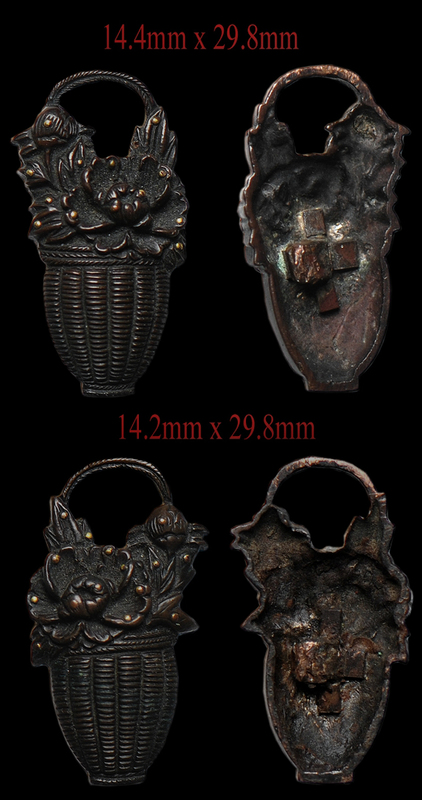 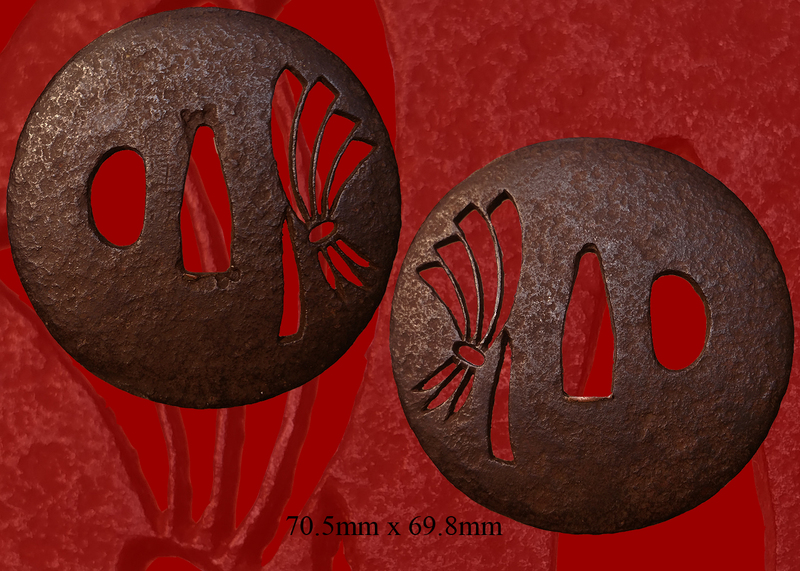 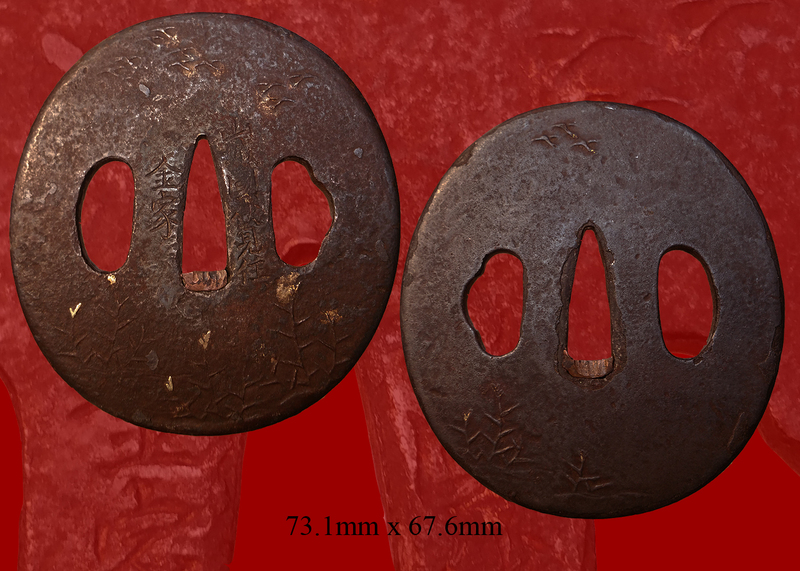 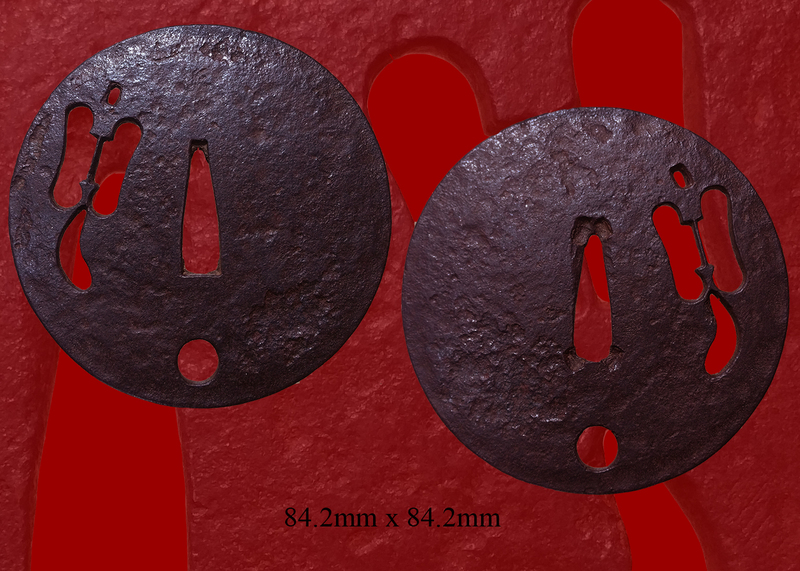 The fuchi Kashira are a iron and very much in the shin-shinto style. 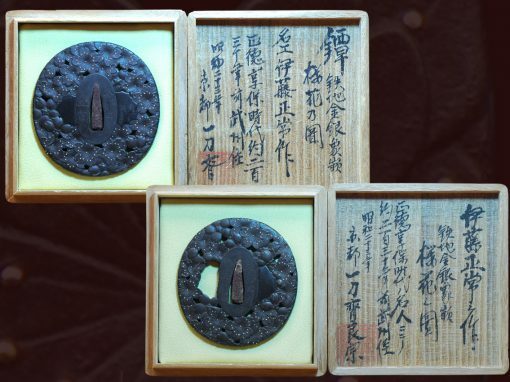 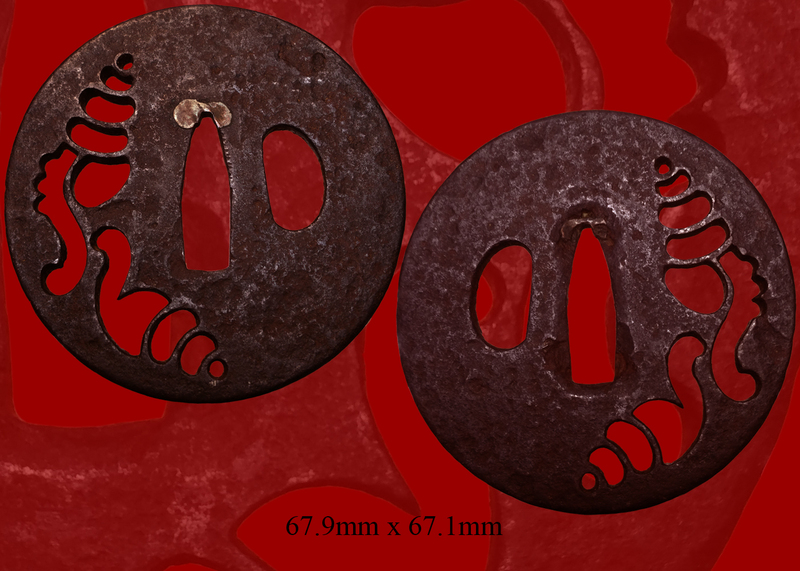 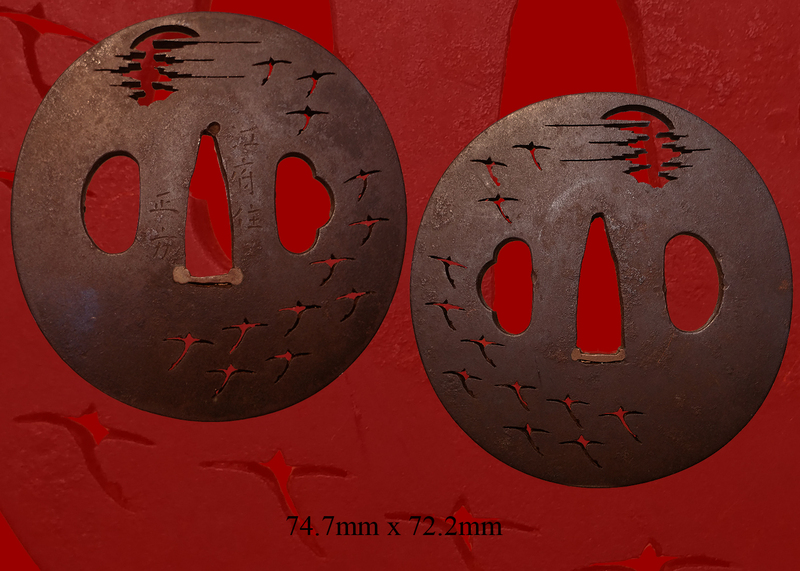 The tsuba is an iron geometric pattern accented in gold with square mimi-gata lobes and may date back to the late koto era. 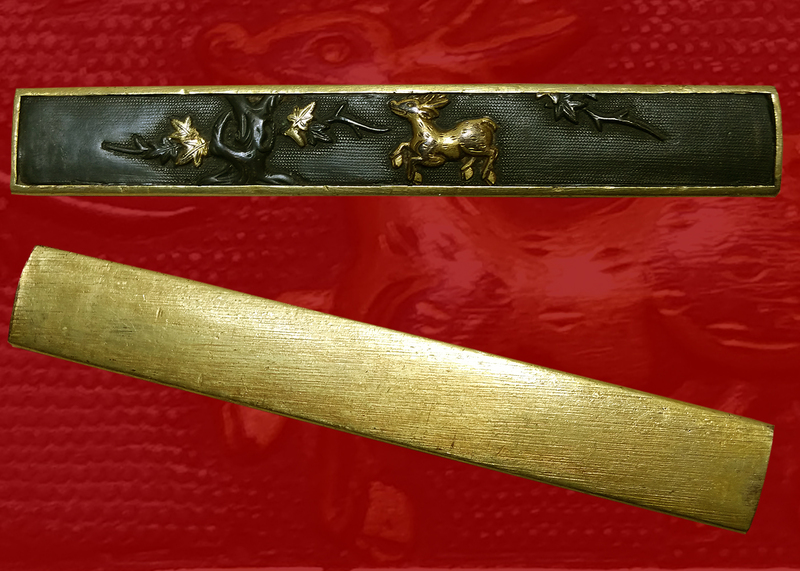 A beautifully finished Gold washed Habaki to complete the Koshirae for this wonderful long Shinogi-Zukiri style sword. 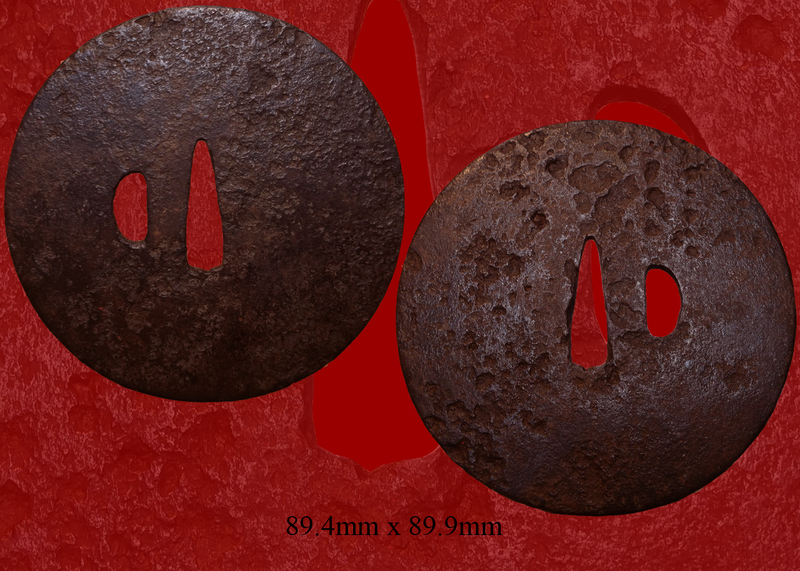 Email us if your interested in this item and remember to include the order number for this item: fss-802. 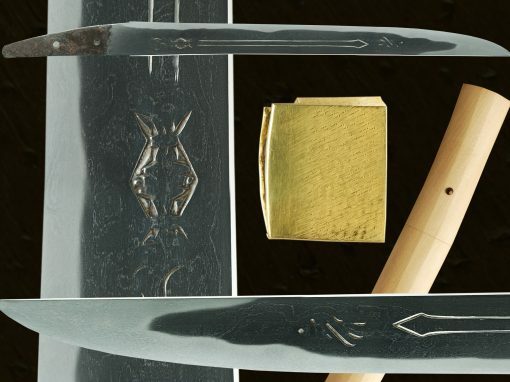 LEVEL PAPERS AUTHENTICATING THE BLADE AND ITS QUALITY.